Simply add powder. Select ounces and press start. Baby's bottle is ready in seconds. Works with all formula powder brands and types. Works with all bottle shapes and sizes. Formula funnel detaches easily for simple everyday cleaning. Formula Pro Prepares the perfect bottle for your baby. Mixes, heats and dispenses Formula in seconds. Baby's mealtime made easy. 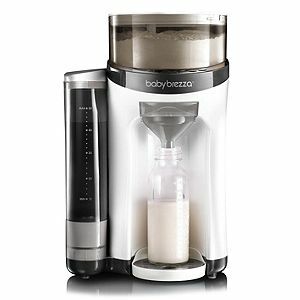 Heats water to the perfect temperature and mixes powdered formula in a baby bottle for quick and easy bottle feeding. Water is heated to 98.6 body temperature, and the ideal temperature for bottle feeding. Formula funnel detaches easily for simple everyday cleaning. Holds 50 ounces of water - enough to make 24 two-ounce bottles, 12 four-ounce bottles, 8 six-ounce bottles or 5 ten-ounce bottles. Fits all bottles shapes and sizes. Holds approximately 700g of powdered formula.